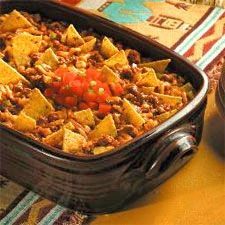 Taco Casserole! - I Am Proud Of My Kids! I love tacos, and I love casseroles. Now I can have both with this tasty recipe from yumm.com. There is nothing like cutting into layers upon layers of deliciousness, and giving your taste buds the roller coaster ride of their life. Check out the ingredients and easy-to-follow cooking directions below. cover the meat with sour cream mixture. Sprinkle with cheese and remaining crushed chips. Bake, uncovered, for 30 minutes or until cheese has melted. Top with 3/4 cup salsa if desired. 2 Comments on "Taco Casserole!" You can make this even healthier by using ground turkey. Looks yummy and I’ll definitely try it.